With snowpack only around 10 percent of normal, at least three companies offering raft trips on the Kern have already cancelled operations, including River’s End Rafting, Kern River Tours and Kern River Outfitters. Another indicator of the times: Held every third weekend in April for the past 50 years, the Kern River Festival also pulled the plug on this year’s event. While Kern River Tours and Kern River Outfitters didn’t run trips last year either, at least one outfitter is making do. But it really bothers him that he can’t go out and take his noon paddling lap. “It’s why we’re here,” he says. 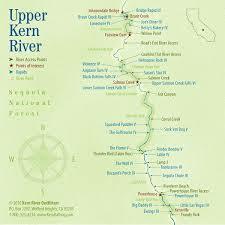 “Usually, between the Upper and Lower Kern you’re boating from April through September. Now we might not get any at all. And there’s no where else to go. The whole state is dismal. We need a big water year, and we need it soon.” Further illustrating the state of affairs, he adds that the state is asking people to not boil their Easter eggs this year. Water officials say the lake levels are so low because it was already drained as low as possible last year, and this year’s lack of snowfall exasperated things. In fact, officials don’t even have models for how to operate the river at this level, putting outfitters in a lurch with many bowing out instead of trying to patchwork trips together. Beside Sierra South, other outfitters who do plan to give operations a go this year include Whitewater Voyages and Mountain & River Adventures, who hope to focus their efforts on a scenic section just below the main Lake Isabella dam. But that’s a far cry from what the river corridor is usually able to offer customers.